Save Marinwood-Lucas Valley - our community, our future: Zone of Possible Contamination includes all of Casa Marinwood, a parts of Roundtree and Blackstone Canyon Rd. Zone of Possible Contamination includes all of Casa Marinwood, a parts of Roundtree and Blackstone Canyon Rd. The above circle represents the Zone of possible contamination from Prosperity Cleaners toxic waste site located at 187 Marinwood Ave, San Rafael., CA. High levels of toxins have been discovered on the eastern most edge of the circle (right hand side of map) and a radius has been drawn around it to signify other possible contamination locations. 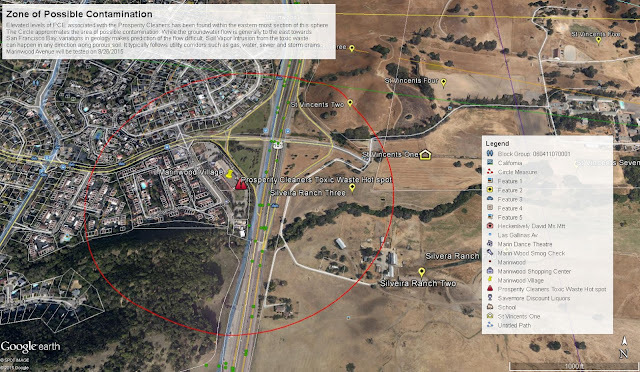 While most of the toxic waste contamination from Prosperity Cleaners is expected to flow on the down gradient towards San Pablo Bay East, new soil vapor testing has proven contamination exists just a few feet away from Casa Marinwood. There is effective treatment available once testing inside Casa Marinwood is complete. Residents need to know that there appears to be no risk of their drinking water to be contaminated. The Clean Up Marinwood Plaza Now Oversight committee will hold a meeting in conjunction with Supervisor Damon Connolly's office and the Regional Water Quality Control Board in the next few weeks.